A project applying the science of epigenetics to demonstrate the health dangers of hookah smoke won a first-place Addiction Science Award at the 2017 Intel International Science and Engineering Fair (ISEF)—the world’s largest science competition for high school students. The awards are coordinated by the National Institute on Drug Abuse (NIDA), part of the National Institutes of Health, and Friends of NIDA, a coalition that supports NIDA’s mission. The Intel ISEF Addiction Science Awards were presented at a ceremony Thursday night at the downtown Convention Center in Los Angeles. The first and second place awards went to students using epigenetics—how the environment can change gene expression. 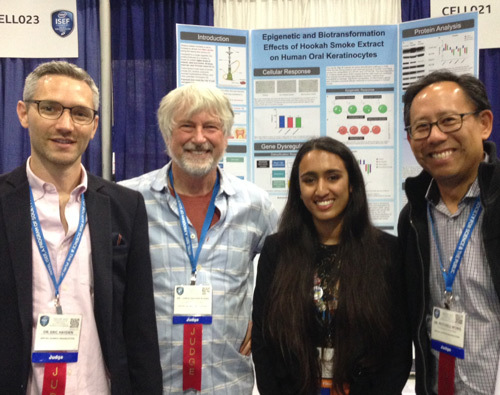 First place went to 16-year-old Anusha Zaman from the Baton Rouge Magnet High School in Louisiana, for her project, Epigenetic and Biotransformation Effects of Hookah Smoke Extract on Human Oral Keratinocytes. The high school sophomore analyzed the effect of wet and dry hookah smoke extracts on epithelial cells taken from inside human mouths. She discovered that hookah smoke induces potentially detrimental cellular responses relevant to inflammation and cancer. Her findings suggest that hookah smoke produces adverse health effects similar to those produced by cigarette smoke. Honorable Mentions were awarded to 18-year-old Anuj Gupta from Roslyn High School in Roslyn Heights, New York for Do Parents Really Know Best? Investigating the Relationship between Perceived Parental Goals and Academic Factors; Dilge Kocabas (age 17) and Dilara Alev Ortel (age 19) from the Takev Fen Lisesi School in Izmir Narlidere, Turkey for Illegal Substance Biodetectives: Apta-Liposomes; and 15-year-old Caleb Martonfi from Tuscumbia High School in Tuscumbia, Missouri for And the Winner Is…Developing a Computer Program to Investigate Neural Competition with Multimodal Stimuli. In referring to all of the awardees, Dr. Volkow commented, "It’s very gratifying to see the creative contributions that these young researchers are already making to the science of drugs and substance use disorders, including the factors that might underlie vulnerability for drug-taking." Judges for this year’s Addiction Science Awards included three NIDA grantees from the University of California at Los Angeles (UCLA): Drs. Chris Evans, Vivek Shetty, and Mitchell Wong, as well as UCLA neuroscientist Dr. Eric Hayden. This year, about 1,800 students from more than 75 countries, regions and territories participated in the Intel ISEF competition, coordinated by the Society for Science and the Public. The nonprofit organization partners with Intel—along with dozens of other corporate, academic, government and science-focused sponsors—to provide support and awards each year. Addiction Science winners receive cash awards provided by individual scientists in the field through Friends of NIDA, with a $2,500 scholarship for the first-place honoree, $1,500 for second place and $1,000 for the third-place distinction. NIDA has developed a special section on its website, which includes other resources on addiction science, to highlight the winning projects and to help science fair entrants understand the criteria for the awards: The NIDA Science Fair Award for Addiction Science. NIDA. "Epigenetics takes center stage with this year’s Addiction Science Awards ." National Institute on Drug Abuse, 19 May. 2017, https://www.drugabuse.gov/news-events/news-releases/2017/05/epigenetics-takes-center-stage-years-addiction-science-awards. NIDA. Epigenetics takes center stage with this year’s Addiction Science Awards . National Institute on Drug Abuse website. https://www.drugabuse.gov/news-events/news-releases/2017/05/epigenetics-takes-center-stage-years-addiction-science-awards. May 19, 2017.